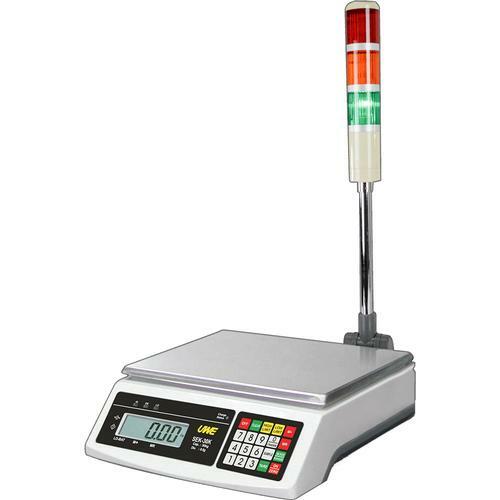 The SEK Checkweighing Scale from Intelligent Weighing Technology is a dedicated “checkweigher” that allows you to weigh a sample against a predetermined set of parameters. Simply tell the scale what you want to be considered “too light, too heavy, or just right”. The scale comes with a Hi-Lo-Go light tower (as pictured) for easy operation. This unit is great for quality control, order fulfillment, manufacturing or production. The SEK Checkweighing Scale from Intelligent Weighing Technology is a dedicated "checkweigher" that allows you to weigh a sample against a predetermined set of parameters. Simply tell the scale what you want to be considered "too light, too heavy, or just right". The scale comes with a Hi-Lo-Go light tower (as pictured) for easy operation. This unit is great for quality control, order fulfillment, manufacturing or production.